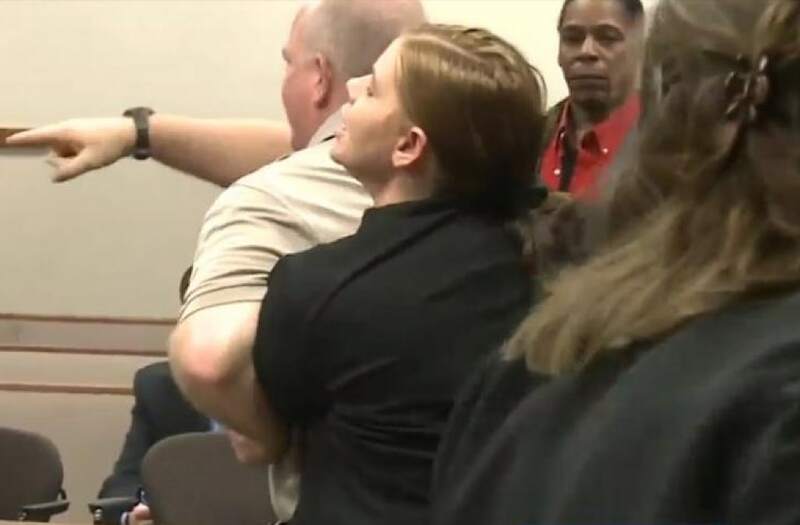 Emotions were high Monday morning as a Kentucky woman was dragged from the courtroom as she tried to attack the man accused of killing her two sons. Courtroom cameras captured the moment Elizabeth Marie Wren confronted Brice Rhodes, the man accused of stabbing her teenage sons and burning their bodies, WLKY-TV reported. "I just flipped out. I couldn't take it no more," she told the network. Footage from the intense stand-off shows Wren lunging for Rhodes, only to be constrained by others in the courtroom at the time. "Lock me up. Lock me up. Why don't you let me get to him? He's sick!" Wren shouted as she attempted to get close to the suspect. Per WLKY-TV's report, Rhodes turned in Wren's direction at one point during the hearing and laughed which pushed her over the edge. "Ain't nobody going to sit in court and hold their composure and have (someone) turn around and laugh about killing your kids," Wren said. "It's just not going to work." She was removed from the hearing in the midst of her outburst. According to the Courier-Journal, Rhodes is one of four men charged in the 2016 murders of Maurice "Reece" Gordon and Larry Ordway. The boys were 16 and 14 years old respectively at the time. The newspaper reported that another defendant, who wasn't identified, told detectives Rhodes killed the two teens because they'd seen him kill someone weeks earlier and feared they'd go to the authorities. Gordon and Ordway's bodies were found behind an abandoned home in May 2016. Wren is committed to seeking justice for her slain sons, she told WLKY-TV. "Every Sunday you go to church and you pray and you try to forgive," she said. "But the anger still builds up in your soul." Prosecutors are reportedly seeking the death penalty for Rhodes, who has pleaded not guilty. The other three men implicated in the crime have taken plea deals and are awaiting sentencing.